Before the promulgation of the periodic law the chemical elements were mere fragmentary incidental facts in nature; there was no special reason to expect the discovery of new elements, and the new ones which were discovered from time to time appeared to be possessed of quite novel properties. 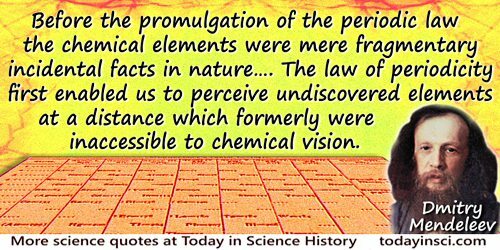 The law of periodicity first enabled us to perceive undiscovered elements at a distance which formerly were inaccessible to chemical vision, and long ere they were discovered new elements appeared before our eyes possessed of a number of well-defined properties. In Faraday Lecture, delivered before the Fellows of the Chemical Society in the Theatre of the Royal Institution (4 Jun 1889), printed in Professor Mendeléeff, 'The Periodic Law of the Chemical Elements', Transactions of the Chemical Society (1889), 55, 648. For example, there are numbers of chemists who occupy themselves exclusively with the study of dyestuffs. They discover facts that are useful to scientific chemistry; but they do not rank as genuine scientific men. The genuine scientific chemist cares just as much to learn about erbium—the extreme rarity of which renders it commercially unimportant—as he does about iron. He is more eager to learn about erbium if the knowledge of it would do more to complete his conception of the Periodic Law, which expresses the mutual relations of the elements. From 'Lessons from the History of Science: The Scientific Attitude' (c.1896), in Collected Papers (1931), Vol. 1, 20. [This] may prove to be the beginning of some embracing generalization, which will throw light, not only on radioactive processes, but on elements in general and the Periodic Law.... Chemical homogeneity is no longer a guarantee that any supposed element is not a mixture of several of different atomic weights, or that any atomic weight is not merely a mean number. From Chemical Society's Annual Reports (1910), Vol. 7, 285. As quoted in Francis Aston in Lecture (1936) on 'Forty Years of Atomic Theory', collected in Needham and Pagel (eds.) in Background to Modern Science: Ten Lectures at Cambridge Arranged by the History of Science Committee, (1938), 100. Cited in Alfred Walter Stewart, Recent Advances in Physical and Inorganic Chemistry (1920), 198.